Diepholz (German pronunciation: [ˈdiːphɔlts]) is a district in Lower Saxony, Germany. It is bounded by (from the northeast and clockwise) the districts of Verden, Nienburg, Minden-Lübbecke (in North Rhine-Westphalia), Osnabrück, Vechta and Oldenburg, and by the cities of Delmenhorst and Bremen. The biggest city is Stuhr. From the 12th century to 1585 Diepholz was a sovereign Noble Lordship, later County, within the Holy Roman Empire that was ruled over by the Noble Lords, later Counts, of Diepholz. At the beginning of the 16th century there was great pressure from the powerful duchy of Brunswick-Lüneburg, which tried to annex the smaller states. By forming an alliance with the neighbouring County of Hoya and asking for help from the emperor himself the state of Diepholz managed to survive some more decades. In 1585 the ruling family became extinct, and Diepholz was eventually annexed by Brunswick-Lüneburg. In 1932, the district of Grafschaft Diepholz (County of Diepholz) was established by merging the former districts of Diepholz and Sulingen. The former district of Diepholz was roughly identical to the medieval state, while the Sulingen district had been a part of the County of Hoya. 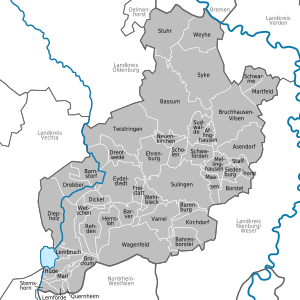 The present district of Diepholz was formed in 1977 by merging the former districts of Grafschaft Diepholz (County of Diepholz) and Grafschaft Hoya (County of Hoya). The district extends from the southern outskirts of Bremen to the border of North Rhine-Westphalia. In the south there is the Dümmer, a lake with an area of 16 km², which is surrounded by fens. Many rare bird species breed in the reeds around the lake. The northern portions of the district are occupied by forests and agricultural lands. The lion is taken from the original arms of the Count of Diepholz. The bear claws are from the arms of Count of Hoya. This combination symbolizes the merger of County of Diepholz and County of Hoya in 1977. Wikimedia Commons has media related to Landkreis Diepholz.